During each run, Na'Not'K has +1 strength for each piece of ice protecting the attacked server. Yes, the pumping cost is awkward. But this is a killer for the big servers. Against shapers corps often put 3 pieces of ice, if not more, on R&D. In such a situation the base strength is 4, enough to break plenty of ice cheaply. And if you look at the list of 5+ strength sentries few of them are actually encountered in the wild on a regular basis. But let's face it, there will always be situations where you need more power, either because a server hasn't been iced enough yet to boost the strength enough or because you run into a rare 5+ strength sentry. For such cases shapers have some existing tools such as The Personal Touch, Net-Ready Eyes and Dinosaurus and there are events such as Lean and Mean and Injection Attack. If you do need to boost manually however it's pretty likely that you'll only need 1 extra strength, in which case paying 3 is pretty gosh darn inefficient. A useful side-effect of playing Na'Not'K may be that the corp will be wary of creating too high stacks of ice, though glacier play isn't so popular that this will actually happen all that often. 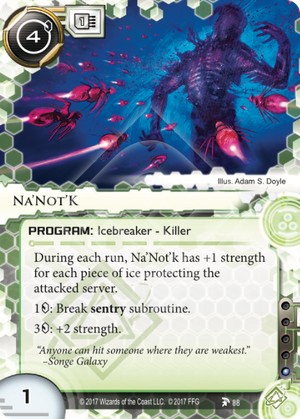 Overall I think Na'Not'K is an interesting breaker, with proper support in a deck it is a solid in-faction alternative to criminal breakers. Mimic is generally considered a solid card. It saw lots of play in the early years of the game and it's still efficient at what it does. Na'Not'K costs one more than Mimic, but it saves one influence in-faction. The only time it's worse is against a lone strength 3 sentry. That's pretty rare. For these reasons it seems likely that this will see play as a good-but-not-great killer option in shaper. This card already has 3 reviews, but I want to add my two cents. A major point nobody here brought up when comparing it to Mimic, is that Mimic is a fixed strength breaker. This is very relevant, as shapers are the faction which plays Self-modifying Code. This card allows them a lot of the aggression they usually lack. Just install an SMC and run happily with the knowledge you can just fetch any breaker you want to deal with the ice the corp rezzes. Unfortunately, Sentries tend to be the worst type of face checks. Running head first into an Archer, Colossus, Ichi 1.0 or Cortex Lock could potentially set you back enormously or even lose you the game. And Mimic can't break these sentries unless you already loaded up your Datasucker, which again requires more support. You could tutor for Mimic before you start running AND install Dedicated Processor on it but that also takes up time. This is where Na'Not'K comes in. Sure, the boosting is kinda awkward. But here's the thing, you can boost. And it allows you to deal with any sentry, provided you have the cash. This makes it ideal for big rig shaper decks like Kate, who is strong late game but suffers from lack of early game pressure. With this breaker you can keep the corp on their toes, while waiting for a Dedicated Processor to make it more efficient. tl;d: It does not compare favorably to Mimic in the credit department, but the ability to tutor it with SMC and boost it makes it worth it. This would become the go-to Shaper Killer, if not for that last line. 3 for 2 STR is very, very awkward. I think it's best to treat this as a Mimic, that being requiring Datasucker, Dinosaurus or similar STR pumping support.